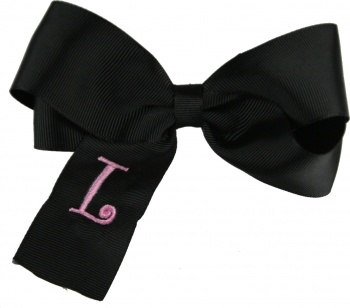 Black Boutique Bow has one longer tail that shows off your first initial. The cost of the embroidery is already included for this style bow so just let us know what letter you would like in the Mono curls font and we can do it for you. This is a 1.5 inch black grosgrain ribbon in a boutique style hair bow. Also, let us know if there is a certain color you would like the initial to be in and we will let you know if we have it.